We have tried to Climb the Fairfield Horeshoe before but the Weather has always let us down, however on this occasion the weather blessed us with very high temperatures and at last no wind. The Horsehoe is a long walk and is very strenuous with over 3432ft of ascent and 10.3 mile in length, and bags eight Wainright fells so its good for getting your tally up. We used Wainrights Book number 1 the eastern fells to help us with our trek and is great to get out on the peaks to help identify other fells, many miles in the distance, also this route used two OS maps numbers - OL5 - OL7 these are a must so please take them and know how to read them as the weather on Fairfield can get very grim and the paths can soon disappear in the mist. 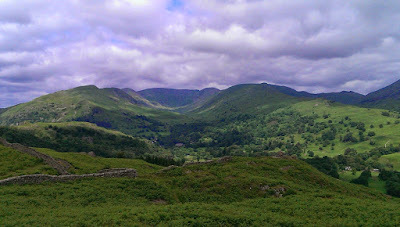 We started the walk from Rydal hall campsite and headed along a path until we come to a Scandale beck, running east we then found the path near to Low Sweden bridge and headed north through low Sweden Coppice - High Sweden Coppice and then to High Sweden Bridge. The path is clear and easy to find but the gradient starts to get very steep along this path but nothing to give you any problems, however you will soon encounter the bogs that lie along the route to Low pike . There is a warning notice that informs the walker to keep to the wall, however we found it to be worse there so detoured slightly east and found a safe path without getting our boots wet, its then a steady but steep climb to Low Pike. some people keep to the left of the wall and some people go to the right on the way, we took the left and found it no problems however on reaching Low Pike summit the Cairn summit is on the right so keep this in mind. Low Pike (map➤) was soon reached and again just follow the wall and head North to its big brother High Pike (map➤) at 656m to the east from here you will see into the Scandale valley and see the small Scandale fell, also to the east you will see the long ridge to red screes (map➤) this we climbed two days later. 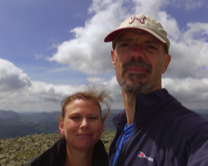 Again go North from High pike towards the summit of Dove Crag (map➤) then North west towards Hart crag (map➤) at 822m this is a great ridge walk with a little height to gain as we neared the highest summit of the walk Fairfield (map➤) the views from here are outstanding. Helvellyn and striding edge are clearly visible towards the northwest as well as Dollywagon pike, towards the west you can see great Gable, Pillar, and also the Scafell range in fact you have to get your wainwright out and sit down for a while and just name them. We met an old boy at the top of Fairfield he was 73 years old and in great shape and he helped me by showing us some of the routes he had done, I have made a note of these and we will return shortly to complete some more. It was then we made our way back to Rydal climbing the following Fells Great Rigg (map➤) - Heron Pike (map➤) and finally Nab Scar (map➤). A great walk and in good weather a real treat we hopefully will be back soon around this area to get a few more fells done.